Just to assure you of my dedication to complete the GTE Big Ride Across America on June 15, I want to share some of my personal achievements as a cyclist. 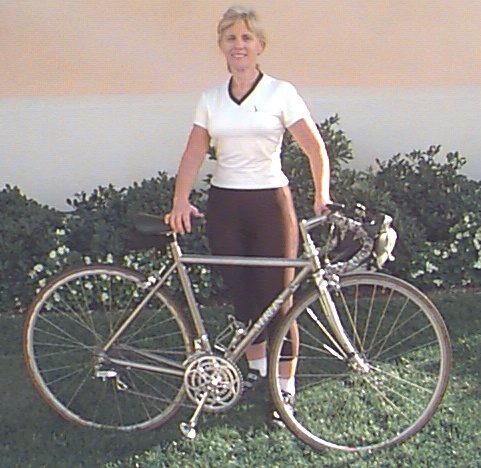 I have been an avid cyclist for 10 years and a member of both the Bicycle Club of Irvine and the Orange County Wheelman. In 1997, I completed my 5th year in the California Triple Crown series by finishing my 25th Double Century. These 200 mile bike rides consisted of Death Valley, Hemet, Davis, Rainbow, Heartbreak, Eastern Sierra and the Grand Tour Double. During my training for these doubles, I completed numerous centuries, and many fun shorter club rides. Two notable rides to mention would be the California Land Rush, a 430 mile ride from San Francisco to Los Angeles in 2 days, (back to back double centuries) and RAGBRAI (Registers Annual Great Big Ride Across Iowa), a 7 day trip across Iowa covering approximately 500 miles. I am now partaking in a 9 week "torture" cycling clinic with Santiago Cycling to strengthen and improve my cycling skills. My cycling training will continue to consist of at least 200 miles weekly, weight training in the gym, and following a good nutrition program. Through making this commitment and the subsequent self-discovery that comes along with it, I am finding a whole new world opening to me as I shatter my preconceptions about dreaming of and achieving great things. This is not a RAAM ride, but it could be the second best thing! What a great life lesson to learn while helping others. Please join me in my commitment.